Kilimanjaro- a bucket list adventure. Watching the sunrise over the Serengeti and the snows of africa etched into your memory forever. An experience that you will remember sitting in your rocking chair telling your grandchildren about it. Encouraging them to live their lives to the fullest as you did. 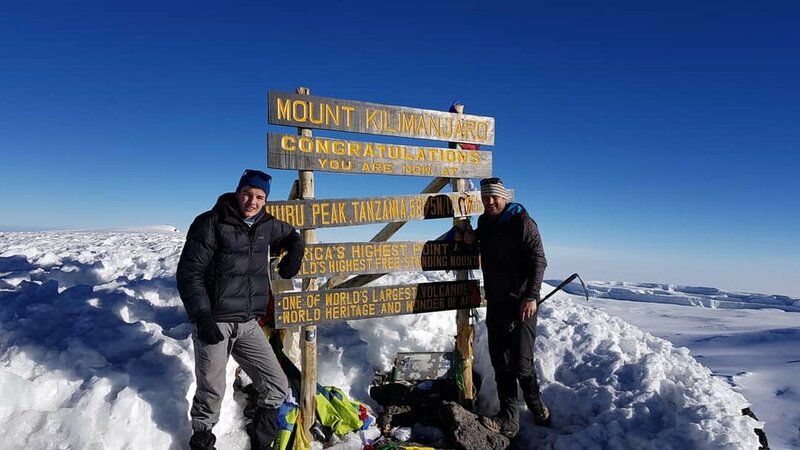 I will be your guide along with my team of super experienced Tanzanian guides, safely taking you to the summit of Africa’s highest peak. I have teamed up with Zara Tours, Africa’s best Kilimanjaro and safari specialists to bring you a safe and affordable way to achieve a life time, real modern day adventure. There is a choice of two climbs, one on the 9th June and the next 17th June. I will be guiding both. After you have climbed Kilimanjaro you can choose a safari, these are on zaratours.com, just have look and decide which one is for you (see my recommendation below). I have designed this adventure so it fits into a two week window, perfect for everyones busy life styles. Teaming up with Zara tours is such a privilege for me and for you… you will have the benefit of Africa’s best Kilimanjaro and safari specialists, their full logistics and most importantly super experienced guides. Some of Zara’s guides have summated Kilimanjaro over 300 times. I will be personally guiding you along the whole journey from New Zealand to Africa - YOUR dream to YOUR summit. I have summated Everest unguided, climbed Kilimanjaro twice myself, taken many teams to Everest basecamp and have lots of experience guiding people at high altitude, tricks and tips that only years of experience can earn. I know how to keep people safe and healthy at high altitude… but I can’t make it easy, this will be the hardest thing you have ever done and it will be amazing. Choose your Adventure…choose your lifetime memory…have some momentary courage and make the decision to come along with me!!! I promise you, you will never forget this adventure. Breakfast is served early in the mess tent and weather permitting; you could take in your first view of the Western Breach of Kilimanjaro. The lunch stop will be reached at about 3600m and after this short lunch and an equally limited rest you will continue up the rocky ridge to the next camp on the mountain, Shira camp (3840). The route now turns east into a semi-desert and rocky environment where you reach an altitude of 4600m after a 5 hour walk to Lava Tower. As you ascend from the Shira camp (3950m), there are good views of the Shira Plateau to the west, Oehler Ridge to the northeast and the Western Breach to the east. This day you will climb high and steep low. The morning starts with a scramble up the almost vertical Barranco Wall to an altitude of about 4200m and after approximately 3 hours, the path now crosses through the southern slopes to reach the Karanga Valley. After breakfast, you continue in a southeasterly direction to the junction before turning north to reach Barafu camp (4600m) after about 4 hours. Here you take a long rest and prepare for the midnight ascent to the summit. 16th June Day 8- Mweka Camp(3100m)- Mweka gate 15kms - Springlands ….BIG PARTY TIME! You will camp for the night at Mweka camp (3100m) before departing for the Mweka Parks Gate the next morning where your driver will pick you up and take you back to the Moshi Bus stand. 17th June - - Team Alpha depart on individual safari’s (see details below) Don’t leave Africa without doing a Safari…. Breakfast is served early in the mess tent and, weather permitting; you could take in your first view of the Western Breach of Kilimanjaro. The lunch stop will be reached at about 3600m and after this short lunch and an equally limited rest you will continue up the rocky ridge to the next camp on the mountain, Shira camp (3840). The route now turns east into a semi-desert and rocky environment where you reach an altitude of 4600m after a 5 hours walk to Lava Tower. As you ascend from the Shira camp (3950m), there are good views of the Shira Plateau to the west, Oehler Ridge to the northeast and the Western Breach to the east. This day you will climb high and steep low. The morning starts with a scramble up the almost vertical Barranco Wall to an altitude of about 4200m and after approx. 3 hours, the path now crosses through the southern slopes to reach the Karanga Valley. You will camp for the night at Mweka camp (3100m) before departing for the Mweka Parks Gate the next morning where your driver will pick up and take you back to the Moshi Bus stand. Cost: $2,073USD Note: This is exactly the same cost that you can purchase directly …. so climb with me! You can’t leave Africa without going on a Safari, and you have many options to choose from. Simply go to Zaratours.com and decide on your adventure. This safari features the popular Northern Circuit game parks. With the best of Lake Manyara National Park, Southern Ngorongoro conservation area, Ngorongoro Crater and Tarangire Safari. Travel in custom designed 4x4 safari vehicles with open roofs for game viewing. This is a small group seat-in-vehicle safari with a maximum of 6 travellers per vehicle, all with window seats. Travelling for 4- days. After breakfast, drive from Springlands hotel to Lake Manyara National Park, which takes about 4 hours. After having a picnic lunch in Manyara, you start a late afternoon game drive, which is the best time to view animals in this park. When you approach it from the East Rift Valley escarpment looms on the horizon forming an impressive back droid to the lake. In the tall trees of the ground water forest, monkeys leap from branch to branch, on the escarpment elephants stand in the shade. Other animals frequently seen are zebras, impalas, monkeys, giraffes, buffalos, hippos and others. Overnight at Highview Hotel or similar hotel for dinner and overnight. After breakfast, drive from the Highview Hotel to Tarangire National Park takes which takes 3 hours. Huge herds of wildebeest, zebras, elephants, elands, and Oryx gather to stay in Tarangire until the onset of the rain. Then, in the late evening drive back to the Springlands Hotel or similar in Moshi bed and breakfast. Watch this space, I am teaming up with the best travel agents in the world to bring you the best prices and service to get you to Africa and your adventure….. more details coming. I have decades of experience traveling in extreme places, not only myself but my family and kids and the one thing I have learnt, from the good way, not the bad way…. IS ALWAYS SEE A PROFESSIONAL TRAVEL DOCTOR BEFORE TRAVELLING ! I use only World wise travellers health Newmarket NZ (and around NZ) , Dr Marc Shaw and his team are the number one Travellers health professional in the world. Dr Marc Shaw is one of a few Doctors that have earnt the title of Professor in Travel Medicine. Health professionals all over the world come to him for the latest advice. I will send you full details on the required vaccinations before you travel to Kilimanjaro. Don’t stress about gear, you can hire sleeping bags and jackets in Tanzania and lots of other stuff. I will put you on the “Mike Allsop Friends” gear list at Bivouac Newmarket - They have a very highly experienced team who can fit you with awesome boots and advise you on everything you need. I will send you a full gear list of everything you need or if you are super curious see zaratours.com . PS: I have a few tricks that will help you…. If you have read all this Im guessing you are keen on this adventure. Personally from my heart, after years and years of adventure, Summiting Everest, 7 marathons in 7 days on 7 continents and many unbelievable adventures with my kids and family. One piece of advise I can offer… take that MOMENTARY COURAGE and decide to come and climb Kilimanjaro, it is a true, real life adventure. Watching the sunrise over the Serengeti and the snows of Africa will bring tears to your eyes, memories that will last YOU a life time….and life is so short… cease the moment!